This is a locational name of Olde English origin which derives from 'Heorot-forda', the crossing place of the deer, or from one of the many places called Hertford, Hereford, Hartford, Harford etc., spelling changes as they occur, being due to localised dialect and spelling. The name is a very early surname appearing twice in the Domesday Book, whilst Richard de Herfordia, a crusader and member of the Knights Templar in 1185, is an early example of incorrect spelling as he was from Hertford. 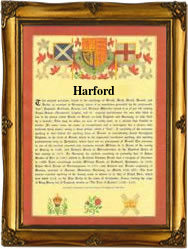 The modern name spellings are Hereford, Harford, Herford, Hurford, and Hartford. John Harford c. 1860, wrote 'the life of Michael Angelo'. The first recorded spelling of the family name is shown to be that of Ilbert de Hertford which was dated 1086, in the Domesday Book during the reign of King William 1, known as the Conqueror 1066-1087 Surnames became necessary when governments introduced personal taxation. In England this was known as Poll Tax. Throughout the centuries, surnames in every country have continued to "develop" often leading to astonishing variants of the original spelling.